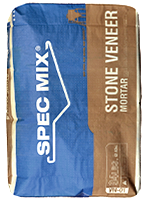 SPEC MIX® Stone Veneer Mortar is a dry, factory blended mortar specifically designed for adhered masonry veneer. This product is produced under strict quality control standards. 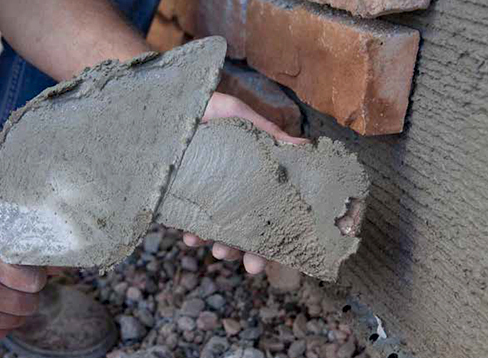 SPEC MIX Stone Veneer Mortar provides superior bond strength compared to standard masonry mortars. It is available in several packaging options to provide savings in handling and mixing. Uses: SPEC MIX Stone Veneer Mortar is used in the application of adhered masonry veneer or wherever a high bond shear strength mortar is required. Quality control - a consistent batch every time. Convenience of handling and transporting one product. Excellent for multi-story and difficult-access jobs.